The Netbell-2-1Bel is a one-stop solution for schools and factories to build an automatic network time alert system for signaling class changes, shift rotations, breaks and any other timed signal applications. 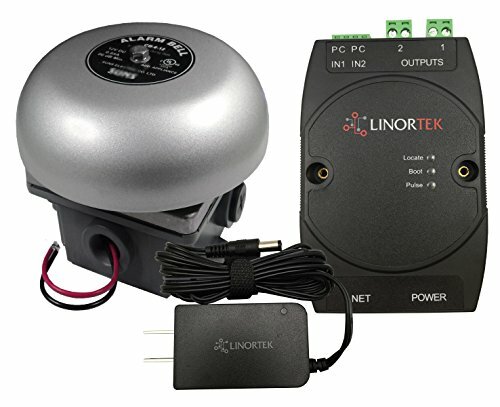 The kit includes one Netbell-2 networked Bell Controller, one 6-inch 12 VDC gray signal bell, one weatherproof back box for wall mounting and one 12VDC power supply to power the bell, one 10-foot power cable. The Netbell-2 bell controller is housed in a Din-rail mountable enclosure with a built-in web server.With the Netbell-2, you can access, control and schedule bells individually over a network, no additional software or designated computer required. The built in web interface provides quick access to setup and manage your bells. It's ready to go out of the box, and you need only connect the unit to 12VDC power or POE and an existing network with the provided cable; it can be connected anywhere on the network, and does not require a direct connection to a PC. Scheduling and setup is accessed through any standard web browser. With the digital inputs you have the ability to wire an external switch for ringing bells manually. For anyone who has separate areas or multiple buildings where running additional wiring is not an option, but the locations are connected by a network, then you can use the Netbell's built-in remote function to deliver signals from a main location bell system to trigger remote bells in different locations over the network.